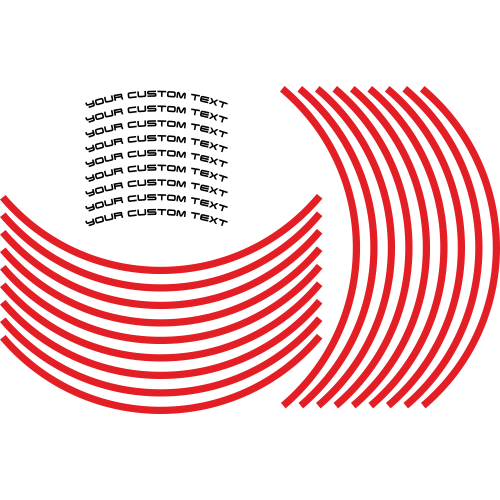 Eight (four per wheel) of curved cut vinyl Wheel stickers in your choice of colour and font (use our font preview below). Letter height is fixed at 7mm, length is determined by your lettering (upto 200mm). The decal is produced with a curve to flow with the shape of a 17" motorcycle wheel rim. Example uses : web site address, name, nickname, team name, sponsors etc. Quality Gloss : 5/7 year grade external sign vinyl. Matt : 3/5 year grade external sign vinyl. Technical Contour cut (no background, no printing) with application tape where required. 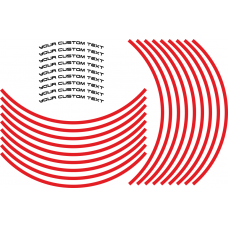 V2 Helmet visor stripThis visor strip is designed to fit the V2 range of Motorsport helmet..
Bell Helmet visor stripThis visor strip is based on Bell's template with a contour suitabl..